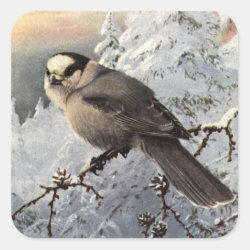 This fine, bold reproduced painting of a Gray Jay is by Canadian bird artist and ornithologist Allan Brooks. The jay is perched on a bare branch in a cold winter snow setting. This classic bird art gift is perfect for bird lovers!